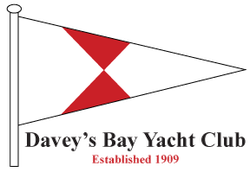 The Organising Authority is Davey’s Bay Yacht Club Inc.
meet their respective class associations’ measurement requirements. be included in the results for club series and/or events. Boat Registration & Storage Form prior to racing each season. Races are scheduled on the Club calendar are available at either the Club website or via the Sailor App. Times shown are starting times for the first division. The race area will be the waters of Port Phillip Bay in the vicinity of Davey’s Bay Yacht Club. 6.2. 3 races must be completed to constitute a series. Commodore’s Cup (first race only) and the Davey’s Bay Cup (first race only). 6.4. The race(s) back to Davey’s Bay Jetty will not be included in a series score. 6.5. Any trophy event to be re-sailed will be scheduled at the discretion of the Sailing Committee. recording device while racing for the purpose of post-race analysis of its performance. decision to participate in a race or to continue racing is hers alone”. or participation in Club activities. equipment provided by each competitor/spectator. Boat Registration Form are deemed to have made a declaration that they hold such cover. Prizes will be awarded for each series at the discretion of the Sailing Committee.